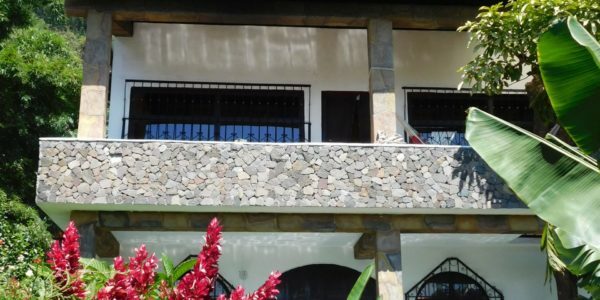 Casa Colina (hill) is a two-story home set in a beautiful, well-kept garden. 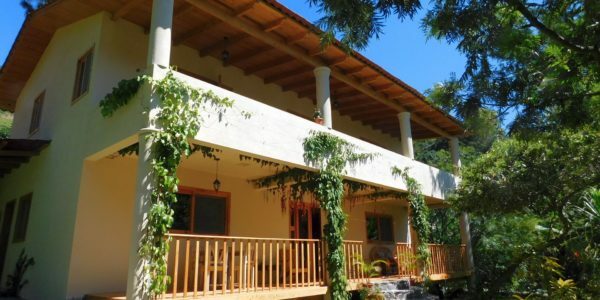 It has 2 large double bedrooms, each one with a half bath in one of Lake Atitlan’s most popular villages for living in and for vacation and short-term rentals, Santa Cruz la Laguna. A covered porch gives way to an open-plan living room and fully-equipped kitchen with dining area. The bathroom with shower (gas hot water) is on the ground level. A spiral staircase leads up to the two double bedrooms with half baths. 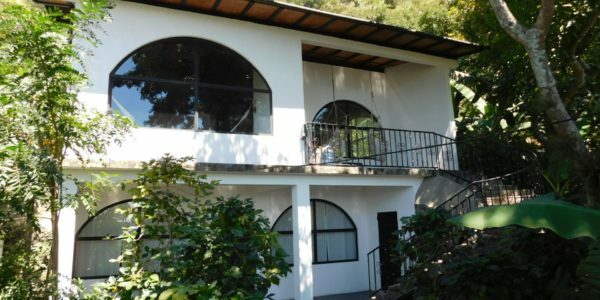 Each bedroom opens onto the balcony than runs the full length of the house front offering lovely views through the trees and vibrant garden to the Lake and volcanoes beyond. There is even space in the large garden for further construction.